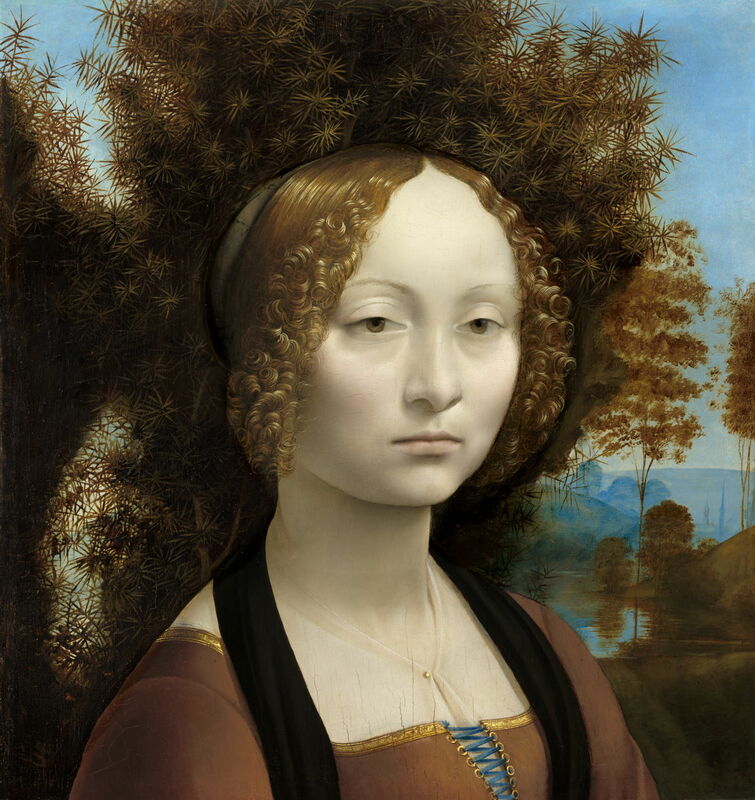 Leonardo da Vinci (1452–1519), Ginevra de' Benci (c 1478-80), oil and tempera on poplar, 38.8 x 36.7 cm, The National Gallery of Art, Washington, DC. Wikimedia Commons. On 2 May, five hundred years will have elapsed since the death of the most revered artist and polymath, Leonardo da Vinci. This series of articles leading up to that anniversary look at his career as a painter, and the few of his paintings which have survived that half millenium. Lionardo di ser Piero da Vinci, as he would have been known, was born on 15 April 1452 in or near the small town of Vinci in the Tuscan hills, then part of the Republic of Florence. He was the illegitimate son of a legal notary in the city of Florence and a local countrywoman, often referred to presumptively as a ‘peasant’. He was raised in his mother’s home, then in the town of Vinci itself, where he received an informal education in the classical disciplines of the Latin language, geometry, and mathematics. His life changed when, at the usual age of fourteen, he was apprenticed to Verrocchio in the city of Florence. I have already written about his master, the output of his workshop, and some of his other pupils. By the time that Leonardo was twenty, in June 1472, he was admitted as a master in his own right to the Guild of Saint Luke in Florence. 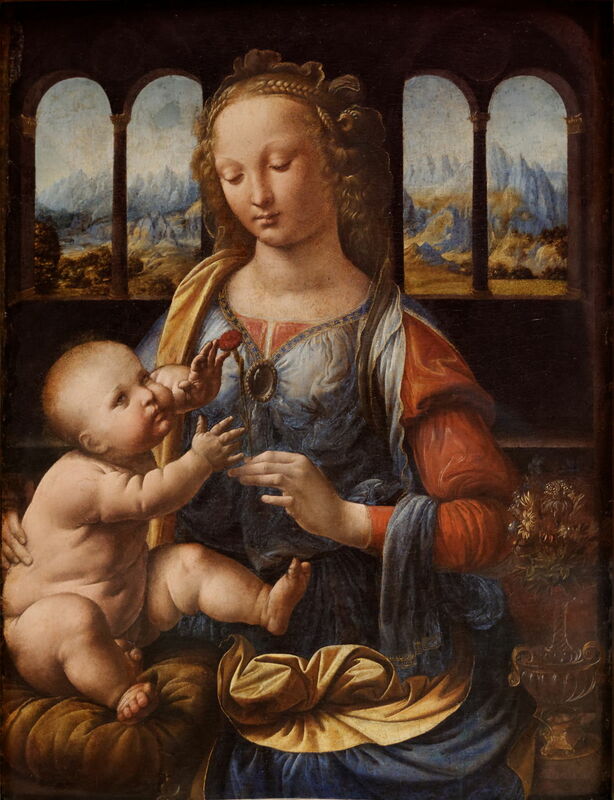 But Leonardo seemed to be in no rush to break from Verrocchio, and in the late 1470s is believed to have finished his master’s Baptism of Christ, for example. 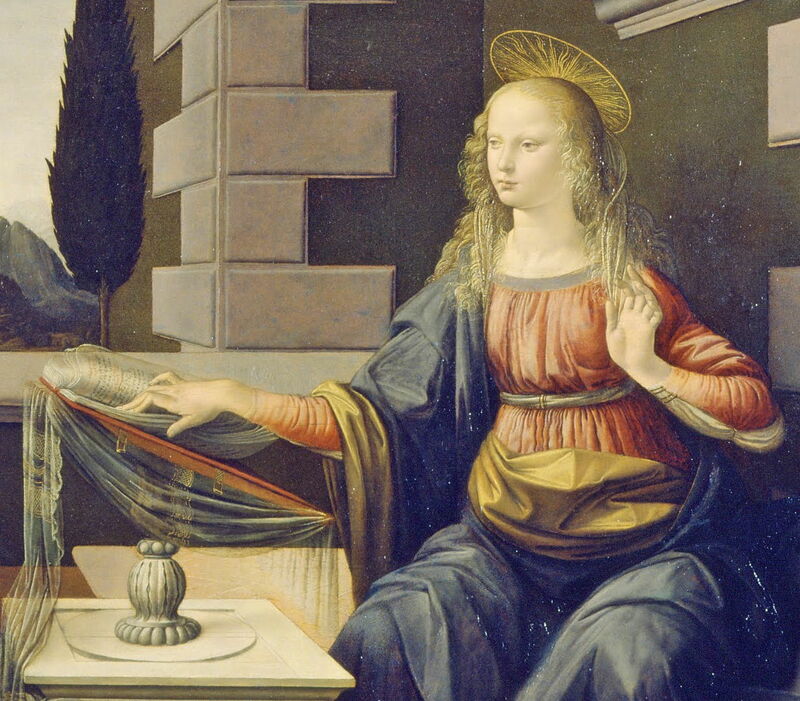 Leonardo da Vinci (1452–1519), Annunciation (c 1473-75), oil and tempera on poplar, 100 x 221.5 cm, Galleria degli Uffizi, Florence, Italy. Wikimedia Commons. This Annunciation, painted in oil and tempera on a poplar panel, is generally agreed to be one of the earliest of Leonardo’s own surviving paintings. When it was painted is in greater doubt, but a suggestion of around 1473-75 seems most appropriate. It shows Verrocchio’s marked influence, coupled with the less confident hand of a new master. There are numerous pentimenti, particularly in the head of the Virgin. Its perspective projection is marked in scores in its ground. Nevertheless, Leonardo used his spontaneous and characteristic technique of fingerpainting in some of its passages. Its composition and execution are conventional and conform to those seen in the output of Verrocchio’s workshop, complete with quite finicky detail throughout. Leonardo da Vinci (1452–1519), Annunciation (detail) (c 1473-75), oil and tempera on poplar, 100 x 221.5 cm, Galleria degli Uffizi, Florence, Italy. Wikimedia Commons. The Virgin Mary is sat reading, as is conventional, her book shown in detail down to lines of its text. The lectern is draped in a diaphanous fabric similar to the wraps in Verrocchio’s Madonnas. The Archangel Gabriel is seen in profile, holding the usual white lily, and the details of his clothing, the flowers, and surrounds are all meticulous. Lorenzo di Credi (1459–1537) (attr), Annunciation (c 1478-85), tempera on poplar, 16 x 60 cm, Musée du Louvre, Paris. Wikimedia Commons. 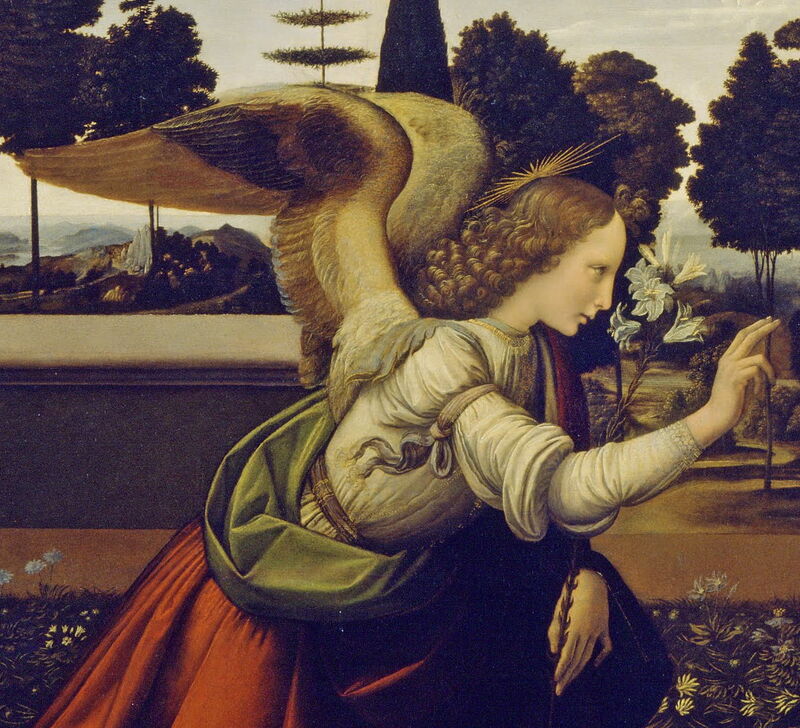 Another of Verrocchio’s former pupils, Lorenzo di Credi (1459–1537), is thought to have painted this superficially similar Annunciation some time around 1478 or 1485, here using egg tempera alone. At this time di Credi was either Verrocchio’s senior assistant or was in charge of his workshop in Florence. The contrast between this painting and that above is marked. In 1478, Leonardo left Verocchio’s studio and seems to have established himself independently, perhaps in a neo-Platonic academy which had been established in Florence by its ruling Medici family. Leonardo da Vinci (1452–1519), Ginevra de’ Benci (c 1478-80), oil and tempera on poplar, 38.8 x 36.7 cm, The National Gallery of Art, Washington, DC. Wikimedia Commons. Another of Leonardo’s earliest works is this magnificant portrait of the legendarily beautiful Florentine Ginevra de’ Benci, which was probably painted around 1478-80, again in oil and tempera on a poplar panel. Her beauty is well-captured, but in conventional terms, with a uniform and idealistic complexion and shallow modelling of features. Detail in the foliage behind her is meticulous, and the glimpse of the distant landscape promising, down to the optically accurate reflection. During the 1470s, Leonardo was developing a deep interest in optics, extending beyond that often found in great painters. Ginevra de’ Benci (1457-c 1520) was apparently greatly admired in a courtly manner by the Venetian diplomat and humanist Bernardo Bembo, who is thought to have commissioned this portrait, most probably when he lived in Florence between 1478-80, perhaps as a gift to Ginevra. Bembo’s personal device is painted on the back of the panel; he was father to the scholar and poet Pietro Bembo, best known today for the typeface named in his honour. Leonardo da Vinci (1452–1519), Madonna of the Carnation (c 1477-78), oil on poplar, 62 x 47.5 cm, Alte Pinakothek, Maxvorstadt, Germany. Image by Yelkrokoyade, via Wikimedia Commons. Madonna of the Carnation from about 1477-78 is perhaps the most complex and ambitious of Leonardo’s early works to have survived. There is doubt as to whether he used egg tempera at all, and it is thought to have been painted almost exclusively in oils. In addition to its conventional figures, there is a floral display at the right edge, and a detailed landscape beyond the symmetry of the windows, with strong aerial perspective. There are signs of inexperience in the use of oils here: wrinkling of the paint layer has occurred, particularly over the Virgin’s face, which resulted from excessive use of oil in an attempt to delay its drying. Nothing is known about this painting’s origin, production, or early history, and it first surfaced in an apothecary’s shop in Günzburg, in Bavaria, Germany. In early 1478, Leonardo obtained his first public commission, to paint an altarpiece for the Chapel of San Bernardo, in the seat of the Florentine government. This also appears to have been his first unfinished work, and hasn’t even been seen in his drawings of the time. Later that year, though, he wrote that he had started work on two paintings of the Madonna, one of which does seem to have survived, and will open the next article in this series. Posted in General, Life, Painting and tagged Bembo, da Vinci, di Credi, painting, Verrocchio. Bookmark the permalink.